Interesting things happen at edges. We are living in one of the most exciting ages of science, shifting from the mechanistic universe that made science seem so cold a century ago to a world shaped by unfolding complexity and fractal wiggles. The probing of brains and the sifting of DNA are helping humans to truly understand how we are related to the natural world in which we evolved. These are the two sets – the work of poets and the work of scientists – that she allows to intersect in this book, like spots of coloured light overlapping to form new shades of illumination for every reader who is engaged with the world. These essays are part memoir, part ars poetica, part wonder-journey, in a wide-ranging and insightful amalgam. 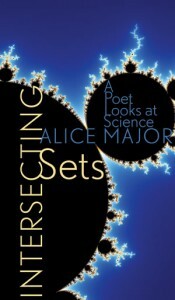 Intersecting Sets: A Poet Looks at Science received the Wilfrid Eggleston Award for non-fiction from the Writers Guild of Alberta. Alice Major also received a National Magazine Award for one of the essays in the book, “The Ultraviolet Catastrophe”, which was excerpted in a special “Quarc” issue of The New Quarterly. Read an excerpt from the book’s introduction. Brain Surgery, or the Schooling of Poets – What kind of brain does it take to write poetry? Poetry and Scale – What does poetic reputation have to do with fractals? The book itself is a lovely object: no surprise that it has won design awards. And reading the essays inside feels like visiting with a curious, thoughtful friend – one who has always just read something interesting and leaves you with lots of new ideas to consider, a friend who also has her feet on the ground, plenty of experience, and an easy playfulness that makes her company a pleasure…. This book is an obvious fit for courses in science writing or creative science writing. Teachers of poetry (and poets) might find it very useful. For courses in prose, it would make an intriguing partner with books like Chet Raymo’s The soul of the night or James Gleick’s Chaos. It would make an excellent gift book, too, for curious friends who take an interest in the sorts of big questios that both scientists and poets sometimes ask. Alice Major, a Canadian poet, has brought the two worlds together very nicely. I loved the way she plays science and poetry off one another. Metaphor relates to Mandelbrot sets. Holograms on credit cards help explain the building blocks of language. Artists’ color wheels and mixing colors relates to black holes. Major’s writing is both clear and lyrical. Readers who, perhaps, have never heard of either Mandelbrot sets or dactylic meter will find those and other concepts explained in ways that are entertaining and related to every day life.